Jordan Smith (left) scored twice in the first 15 minutes for Stamford AFC against Romulus. Deeping Rangers lost a United Counties Premier Division home match for the first time this season today (March 4). 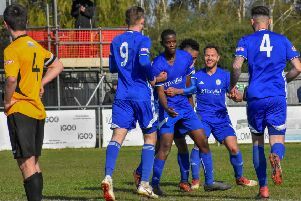 Michael Goode’s men were beaten 2-0 at the Haydon Whitham Stadium by FA Vase quarter-finalists Newport Pagnell who scored twice early in the second-half. It was a golden opportunity missed for Deeping to put clear water between them and the rest of the contenders for the runners-up spot behind champions-elect Peterborough Sports. There were many postponements today so Deeping remain seven points clear of third ahead of next Saturday’s (March 11) big game against Eynesbury Rovers. Second-placed Bugbrooke St Michaels were also clinical in their Division One game at Blackstones as Andy Lodge’s side were hammered 6-0. Jordan Smith scored twice in the first 15 minutes for the Daniels with Jordan Hempenstsall adding a third goal on 25 minutes. The visitors threatened a fightback when netting twice in the second-half, including an own goal from Danny Draper, but Jake Duffy struck for Stamford nine minutes from time to secure the points. March Town, who are 18th in Division One of the Thurlow Nunn Eastern Counties League were disapppinted with their 4-1 home defeat at the hands of 15th placed Debenham LC. Casey Logan scored for the Hares. Among the postponements today was the UCL Cup semi-final between Desborough and Wisbech. Yaxley are waiting for the winners in the final. POSTPONED: Peterborough Northern Star v Holbeach United. POSTPONED: Witton Albion v Spalding Utd. POSTPONED: Boston Town v Yaxley, Harborough Town v Huntingdon Town, Leicester Nirvana v Peterborough Sports. POSTPONED: Desborough Town v Wisbech Town. POSTPONED: Raunds Town v Bourne Town.